Rhonda works part time as an optician and is a big help, and asset to our optical department. 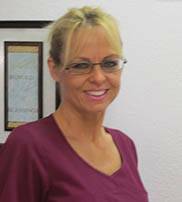 You might see her bubbly personality dispensing and adjusting glasses on our patients. She also check in glasses as they come in from the labs that we use that make the prescription lenses. Rhonda has two children of whom she is very proud of.